I have been teasing you guys about this post for forever now, so I’m excited to finally be sharing our plans for the Studio’s upstairs office space. As most of you know, I am currently both working and living out of my house. While it’s been an amazing couple of years, I have quickly grown out of the space. One of the things I am most excited about with the new Studio Barn is that HBH will finally have a real office space. A space to have team meetings, bring clients into, cook, photograph, film, and write out of. So excited. So very grateful. 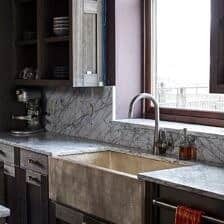 If you missed the first two posts about the Studio Barn, see part one on the layout here, and part two on the kitchen and downstairs bath here. Any of you who may work from home probably know that sometimes living and working out of your house gets a little, well tiring. Some days you never even leave the house, and I don’t know about you guys, but that makes me a little stir crazy. The upstairs office of the studio has been designed to be a creative space for the HBH team to brainstorm, have meetings, do that boring “computer work” stuff, and create the best content we can for you guys. When my mom (who works side-by-side with me on HBH) and I sat down with our designers at Park and Oak, we knew we needed a space that was light, cozy, warm (literally, mom and I are always cold) and felt very creative and inspiring to work in. 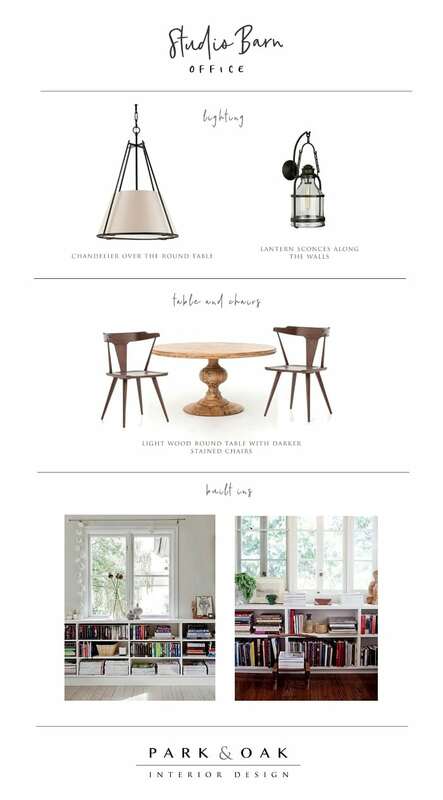 Below is our master inspiration board for the upstairs office. So pretty and fun, right? The office is located in the tip-top portion of the barn called the monitor. 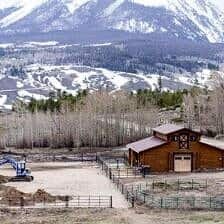 The monitor is the raised center area of the barn, often a loft, or in our case a loft/office! In the loft there are several rectangular windows for ventilation (you know for those 10 days out of the year when it may actually get warm up there), along with a beutiful picture window at one end (so I can keep a good eye on all the baby goats below). There is also beautiful wood floors, plenty of book shelves, and a large table for group brainstorming sessions…finished with a very cool chandelier overhead. There’s also the cutest little bathroom, complete with the coolest tiles from my favorite tile company, Clé Tile. 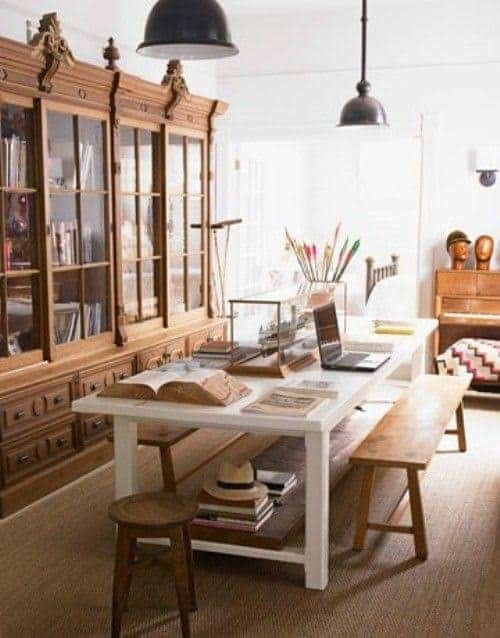 The detail I love most about this upstairs office space are the antique wood desks my mom and I will have. It will be nice for both of us to have a quiet space to get away. Away from the kitchen, and away from any chaos, where we can get in some work on the computer. Whether that’s writing emails, editing photos, or any and all of the other odds and ends we do daily. Another detail I am excited about is the loft area, which is right outside the office. For a while, this was an empty space that we really didn’t know what to do with. Our designer Christina had the idea to turn this space into more of a fun creative break room. Don’t ask me why I am so excited about this because I will probably never use it. But I love the idea that whenever we are working with groups of people, filming and cooking, everyone has a fun place to escape to if they need a little break during filming, or after all the work is over and done. I already know my brother Kai, who films all of our recipe videos, is very excited about this space. He often has down time between filming videos while the next recipe is being prepped. This will be a nice space for people to simply come and hang out, away from the hustle below. And there you have it. That’s the upstairs office! I could not be more excited with how it is coming together. I can’t wait to show you guys the final reveal in just a few more weeks. Please let me know in the comments what you guys think. What you love, what you hate, and also any suggestions you may have. I always love and welcome your feedback! Wow!!! So beautiful! I know you asked for comments on what I don’t like, but I can honestly say nothing…I love it all. More than that, though I don’t even know you, I’m truly so happy for you! What you do for a living brings such inspiration, joy and truly amazing food into my life and I know so many others. I can’t even imagine how hard you must work…you deserve a beautiful space in which to do it! I live overseas now, but am a Colorado girl. So, I’m back every now and then. Hope to make it to one of your workshops someday. This is such an amazing this to receive! Thank you so much Jeannine, I hope you make it to a workshop as well! I am anxious to see the end result of it all. It looks amazing. The only thing I could not live with is the dark tile in the bathroom. I am a white or all light type person. Everyone has their own taste. You are the one that should be happy. It is really a very nice space for you to work in. Congratulations! So happy for your continued success! What an inspiring space! It’s exciting to see this develope. It’s great that you have such a wonderful space to develope and create! Thank you for sharing. What an awesome space(s) you have created. Wow, everything looks really nice. 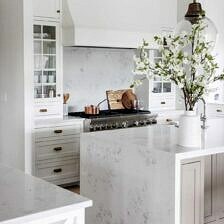 I am excited about that kitchen, the double range and I really like that rustic wood island! 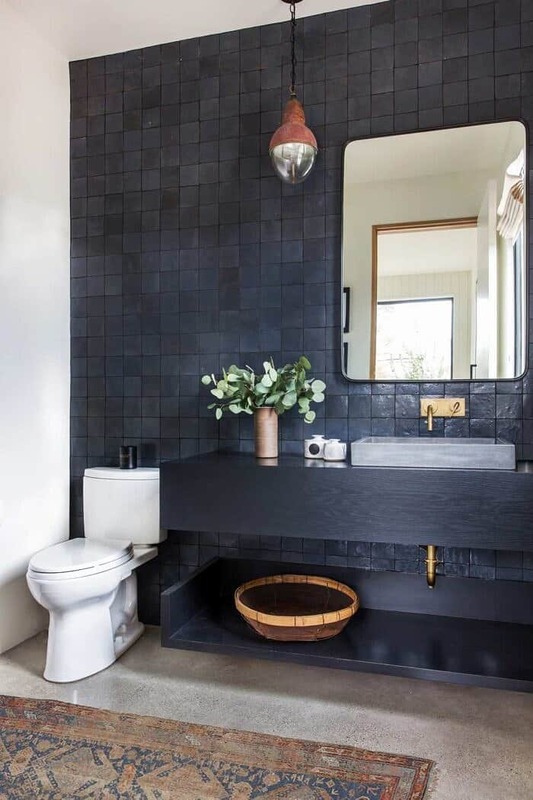 I like the bathroom looks with the dark tiles! I cannot wait to see the final reveal of it all, so exciting!!! BEYOND pretty and fun! I’m being honest here, as always: nothing here I hate or would change. So chic and fabulous. Love this sneak peek – the inspiration board looks incredible!! How exciting!! I am about 10 days away from leaving New York and heading to Breckenridge for the spring/summer/fall and I can’t wait! I hope you have an event at the barn that I can come to!! And I see Silverthorne is having a parade for Red and the other winners! That is so exciting! Thank you Linda! I think you are going to be in this business a long time. After all, who would ever want to leave that space? Haha right? Ill be in there all day! Absolutely love that black tile!!! 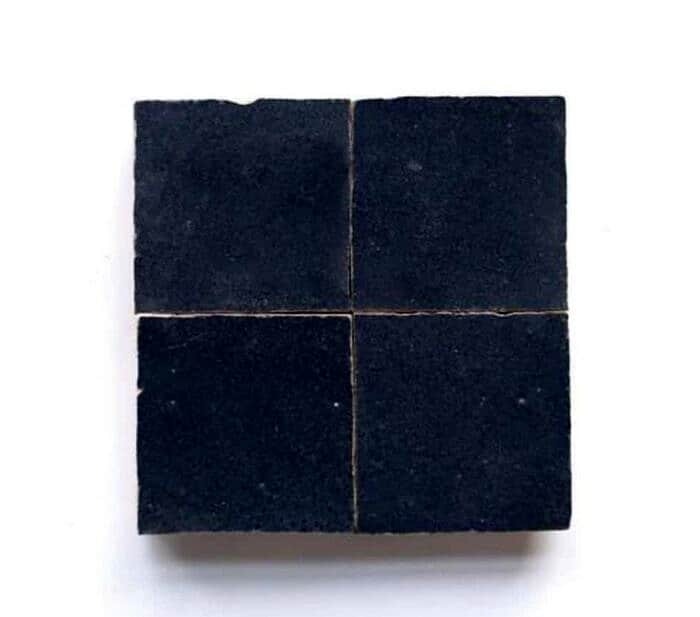 Absolutely love the black tile!!! Keep shinning your light, your an inspiration to all. Sooo Beautiful!!!!! I was hoping if you could share where I can get the pool/ping pong table, I am actually redoing our barn and that would be perfect for the kids…..
Keep shining your light, you are an inspiration to all. This is AMAZING!! Talk about dream house especially for photography! So excited for you (and totally jealous too) – can’t wait to see the progress! !